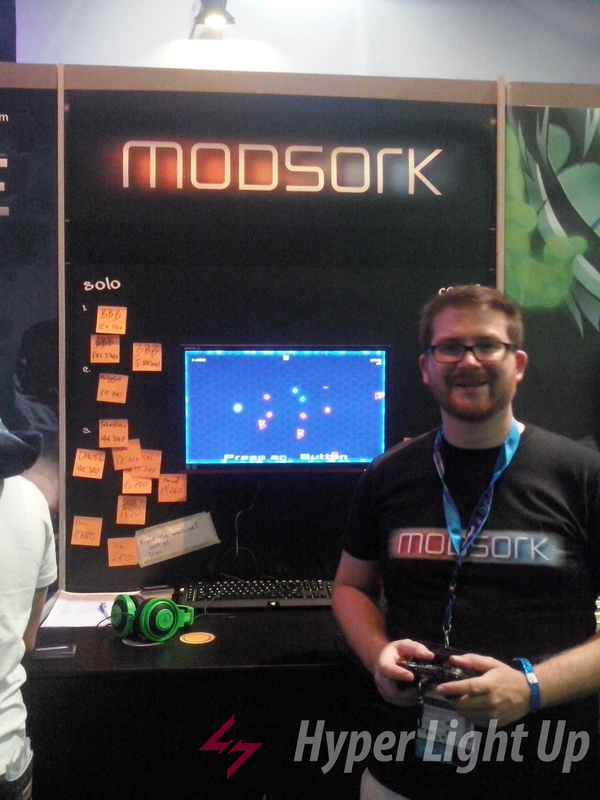 During Gamescom 2016, we found Cinnoman Games at the Indie Arena Booth where the developer was showcasing his game, Modsork. We spoke to David Canela and he shared with us information about the game and its development. The game makes use of two dots (blue and orange) that roam around and are controlled by the thumbsticks on the gamepad. “It’s about doing 2 things at the same time, controlling 2 avatars and connecting them with a laser beam to destroy enemies and raise your high score,” said David as he explained the game to us. The game is indeed based on a very original idea, with fast reflexes and quick decisions. It’s a game about one person managing multiple things. However, there will be a local co-op mode available that should most definitely make things way more interesting and fun. The studio is basically David himself running everything and he has been developing the game for about a year now. “I have been on and off the development of the game, doing contract work on the side as well,” said David. You can track the developement of the game on its official website, on Twitter, on Youtube and on Facebook.